Bobby Blitz comments ""We look forward to bringing 'The Wings' over the USA. It's been a long road but the journey is not over yet. DEATH ANGEL and ACT OF DEFIANCE join us on this jaunt so prepare yourself for a righteous beating. Let the headbanging begin in April!" 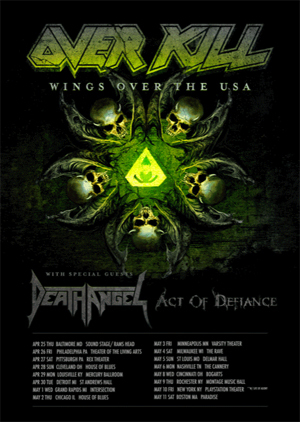 OVERKILL will be touring in support of The Wings Of War which was recorded at Gear Recording Studio in New Jersey, SKH Studio in Florida, Shorefire Studio and Jrod Productions with engineering handled by DD and Dave. The album was produced by the band while Chris "Zeuss" Harris handled the mixing and mastering. Travis Smith (NEVERMORE, OPETH, SOILWORK, DEATH) was once again enlisted to create the artwork for the album. Check out them lyric video for the second single entitled, "Head Of A Pin" below. "Welcome To The Garden State"
"Where Few Dare To Walk"